The purpose of computer storage technology is to preserve data for short-term reuse or for long-term use. It is also known as non-volatile memory- data that continues to exist whether the power is turned on or off. The concept of data storage goes all the way back to the use of punch cards in the 18th century, when they were used in the textile industry in France. When the first personal computers emerged in 1977, however, they benefited from modern data storage technologies far more efficient than punch cards, which, believe it or not, had been the primary form of data storage until the 1950s. When computers started to become popular, they didn’t have on-board storage. That’s where floppy discs came into play. Without computer storage, you had to re-enter data every time you rebooted the machine. This was extremely burdensome and time-consuming, and almost completely eliminated the advantage of having a computer. When the Commodore Pet, Apple II and the TRS-80 ushered in the personal computer age in 1977, the dominant storage medium of the day were cassette tape drives and floppy disks. Cassette tape drives, such as the Commodore Pet’s Datasette brand, wrote digital data onto, and read data from, normal consumer-grade audio cassette tapes. This made the Datasette capable of catering to a lower-priced market, because it used storage media that was highly popular and cheap. The Apple II also used a cassette drive, but it later became capable of using a floppy disk drive as well. The first generation of floppy disk drives used 5.25 inch disk media, which were called floppy disks because of their physical flexibility. 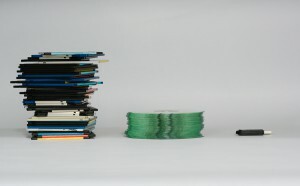 Floppy disks and cassette tapes became and remained the dominant forms of storage media in the personal computer world during the 1970s and 1980s. A typical 1 hour audio tape could store 200 kilobytes (Kb) of data, while a floppy diskette could store up to 360 Kb. By the end of the 1980s, tape drives declined in market share as floppy disks proved to be faster and more reliable, and they also offered greater storage capacities. Floppy disks in turn evolved from single-sided 5.25 inch media to double-sided versions which could record data on both sides of a disk. As 5.25 inch floppy disk technology evolved, this enabled disks to store up to 1,200 Kb, or 1.2 megabytes (Mb). Eventually, these gave way to 3.5 inch media known as micro-floppy disks, which held 790 Kb of data. Later versions of the 3.5 inch disks were designed to hold 1.44 Mb of data. Other 3.5 inch drives were created for a capacity of 2.88 Mb of data, but the 1.44 Mb drives had the most widespread adoption in the market. The 3.5 inch drive first appeared on the market in 1982 and dominated the market by the end of the decade. By the 1990s, the 3.5 inch floppy disk drove the 5.25 inch storage media out of the market, becoming the dominant form of storage media at the time. 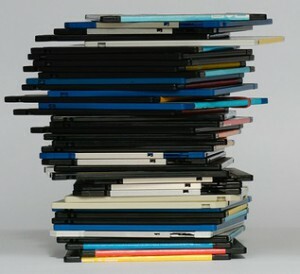 During this time period, over a billion floppy disks are thought to have been in use in the personal computer market. In the 1990s, another storage medium called Compact Disk-Read Only Memory, or CD-ROM, also came into the mainstream. CD-ROMs are optical discs, which means that they require the use of a laser to record data onto the disc, as well as to read it. CD-ROMs slowly grew in popularity as a medium for delivering software from companies to consumers. Companies began to distribute everything from office productivity software and video games to operating system installation disks, via CD-ROM. CD-ROMs were vastly superior to the 1.44 Mb floppy disks, having a storage capacity of 650 Mb, and in addition they read data much faster. CD-ROMs are a form of write once, read-many (WORM) storage, which meant that data could be written to the media only once, but it could be read an infinite number of times thereafter. CD-ROMs replaced floppy disks as a means of delivering software to customers in the 1990s, although users continued to rely on floppy disks for other purposes. In 1996, Digital Versatile Disk (DVD) technology came to the market. Boasting a basic storage capacity of 4.5 gigabytes, DVDs came to replace CD-ROMs as the primary delivery media for computer software at the start of the 21st century. DVDs are based on the same type of optical disc and WORM technology as CD-ROMs, although it is much more advanced. In turn, Blu-Ray DVD technology emerged in 2003, which is an even higher-capacity form of DVD. A competing technology called HD-DVD arose at the same time, but was driven out of the market by Blu-Ray. As a software delivery system it has yet to supplant the DVD, but is the sole content delivery media for the Playstation-3, which is produced by Sony, one of the designers of Blu-Ray technology. Blu-Ray DVDs (BD-ROMs) are an increasingly popular media for computer users to store and archive personal data. 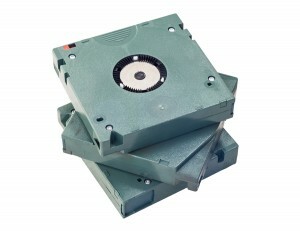 Hard disk drives entered the consumer market in the early 1980s, but did not achieve prominence until the 1990s. Hard drives, unlike floppy drives, do not have their data-storage disk platters exposed to the air, but rather contain them in an air-tight compartment. Hard drives are far faster than CD-ROMs, floppies, or tape backup systems. Hard drive storage capacities vary, but have grown to exceed CD-ROMs or any other form of storage medium by orders of magnitude. Hard drive capacities can reach as high as several terabytes (Tb). Another advantage they have over CD-ROMs is that data can be randomly written to hard drives, changed, deleted, or read. Due to their ever-increasing storage capacities and high-speed, hard drives have continued to endure as the dominant storage medium for personal computers. In addition, practically all computers come with hard drives, and use them to boot their operating systems, as well as store users’ data. Hard drives are, however, notorious for failing and losing data in the process. As a result it is common for users to use CD-ROMs, DVD-ROMs, or even BD-ROM media as vehicles for backing up data off hard drives. Portable storage choices first appeared with the advent of the floppy disk. However, floppy disks finally disappeared from the market when flash drives based on Universal Serial Bus (USB) technology appeared in 2000. USB flash drives are like miniature hard drives, except that they have no moving parts. They have variable storage capacities, from 256 Mb to Terabytes. Flash drives can be used to boot up computers as well as carry any sort of data, from ebooks to music or movies. A variety of related technology has appeared alongside flash drives, including card-shaped Secure Digital (SD) memory. SD cards, in particular, are popular media to use with digital cameras, cell phones and tablet computers. Their speed and storage capacity is similar to that of flash drives. The personal computer market is an ever-evolving world where technologies that are mainstream or dominant today, will become obsolete in the future. While the concept of data storage is one that is unlikely to ever go away, the methods of storage will always be changing and improving. This means that personal data storage will become increasingly faster and offer more storage in a smaller physical space. This means lower prices and increased productivity for customers. Do you need storage for your backup system? Contact us for a free quote today! If you have any questions, feel free to fill out the form to the right or give our experts a call at (866) 385-3706. Our team will help you find the right backup solution for your business.